Any two computers using compatible modems could communicate with each other. Those computers might just be two PCs, a PC dialing into a router or access server at one of the business offices, or a PC dialing into a router or access server at an ISP. As long as both endpoints have a compatible modem, the two can communicate. By the time DSL came around in the mid- to late 1990s, the main goal for remote access was not the capability to connect to any site anywhere, but to connect to either the Internet or a corporate IP network. In years past, modems were used to dial a large variety of different computers, which was useful. Today you can think of the Internet like you think of the electric company, the gas company, and so on—it's a utility that provides IP connectivity to the rest of the world. Because most people today just want access to the utility—in other words, the Internet—DSL can be defined a little differently. In fact, DSL was designed to provide high-speed access between a home or business and the local CO. By removing the requirement to allow connection between any two endpoints, DSL can be defined to reach much higher speeds. Because DSL really just defines how to transmit data between a customer site and the local CO, the expectation with DSL is that the data would not flow through DS0 channels inside the PSTN. Instead, it would be forwarded through some IP network. By removing the need to be compatible with the entirety of the core of the PSTN, DSL can be defined to provide some nice services and better transmission speeds. ■ DSL allows analog voice signals and digital data signals to be sent over the same local loop wiring. 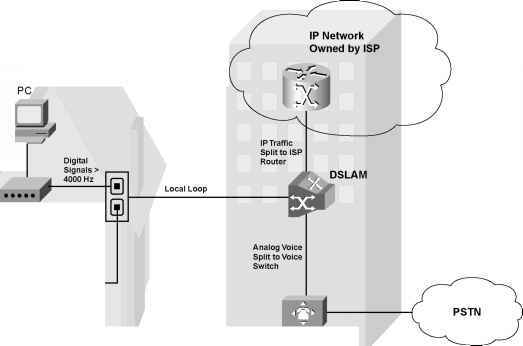 ■ Similar to ISDN, the local loop must be connected to something besides a traditional voice switch at the local CO: a device called a DSL access multiplexer (DSLAM). ■ DSL allows for a concurrent voice call to be up at the same time as the data connection. ■ Unlike modems and ISDN, DSL's data component is always on—in other words, you don't have to signal to set up a data circuit. DSL really does provide some great benefits—you can use the same old phones that you already have, you can keep the same phone number, and you can just sit down at your PC at home and start using the Internet. Figure 15-13 shows some of the details of a typical DSL connection. In the home, a DSL modem or DSL-capable router is connected to the phone line (the local loop) using a typical telephone cable. The cable uses RJ-11 connectors, as is typical for a cable for an analog phone or a modem, with pin 3 for transmit and pin 4 for receive. The DSL modem understands the Layer 1 encoding details for DSL and encodes the data correctly. DSL routers might include the DSL modem feature, as well as providing other features, such as IP routing, allowing the home user to connect multiple PCs in the home to the Internet at the same time. DSL allows a concurrent voice call at the same time as allowing an always-on Internet connection. The figure shows an analog phone and a DSL modem connected to a single wall plate with two receptacles. Physically, you connect your DSL modem to a wall socket just like any of the phones in your house. The phone generates an analog signal at frequency ranges between 0 and 4000 Hz; the DSL modem uses frequencies higher than 4000 Hz so that they do not interfere with each other very much. You typically need to put a filter between each phone and the wall socket (not shown) to prevent interference. The same wiring can be used in the local loop as was used for normal telephone service, but now the CO connects the local loop wiring to a device called a DSLAM. The DSLAM splits the data and voice signals from the local loop. The DSLAM gives the analog voice signal— the frequency range between 0 Hz and 4000 Hz—to a voice switch. The voice switch treats that signal just like any other analog voice line—the switch listens for DTMF tones, creates a circuit, and does PCM encoding to convert the analog signal. The DSLAM does not pass the data traffic into the PSTN, however. The DSLAM forwards the data traffic to a router owned by the ISP providing the service in this figure. Alternately, the DSLAM can forward the data traffic over an IP network, ultimately reaching a router inside a corporate network. Notice that the ISP's router actually is depicted as being resident in the local telco's CO—that is true in many cases. However, many people use an ISP that does not happen to be the local telco. To support DSL, the ISP works with the local telco to install some of the ISP's gear in the CO—a process called co-location, or co-lo for short. 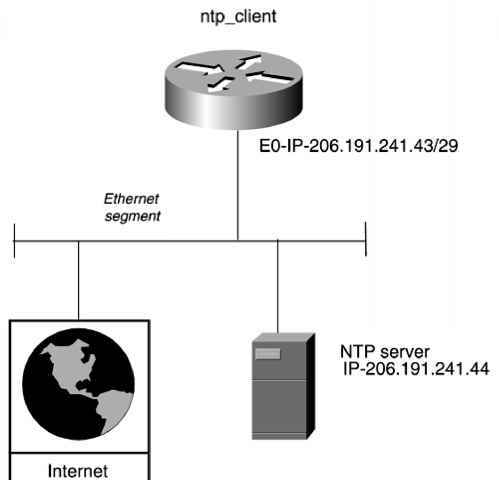 The local telco DSLAM forwards and receives the IP packets to and from the ISP router, while the telco maintains control over the local voice traffic. Typically, the consumer requests high-speed Internet access using DSL from an ISP; the ISP charges the customer for the service, and then the ISP pays the local telco some cut of the fee.